These two maps show the 1860 map President Lincoln used to show the reach of slavery and a 2008 map showing most of the US counties where voters trended more Republican when compared to the 2004 voting patterns in those same counties. 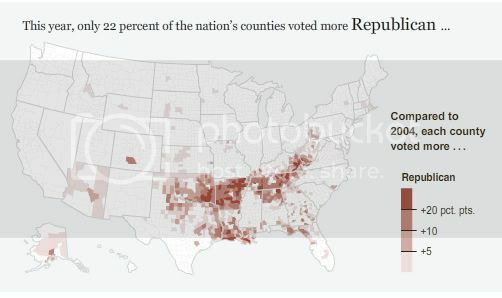 Although the deepest red squares on the voting map do not line up exactly with the counties where there was the highest concentration of slaves at the time of the Civil War, the proximity of the counties that became increasingly red in 2008 to the areas where slave-holding was most concentrated is hard to miss. As many analysts of voting patterns in the history of the United States have pointed out, the convergence of these two phenomena during an election in which a Republican candidate opposed an African-American one is not accidental. Racial attitudes are probably only one factor in the increasing polarization we see in politics today, but it is clearly a potent one. Here in Wisconsin, we can see that voting patterns and racial diversity are also correlated. Nearly 90% of Wisconsin's African American population lives in the following six counties, all of which are located in Southeastern or Southern Wisconsin, including Milwaukee, Dane, Racine, Kenosha, Rock, and Waukesha. We can see the correlation in a map showing how Wisconsin voted in the 2012 Presidential election. Although President Obama won many counties in Wisconsin, he of course gained the most votes in the counties with the densest populations and with the densest concentration of African-Americans (the one exception being Waukesha county). The only other county with a very high turnout of Democratic votes, Menominee, cast a total of 1,376 votes in the Presidential contest and 1,191 (86.6%) of those votes were for the President.